The first question to ask yourself is whether you even need a car during your visit. If you’re planning on spending all or most of your time in Breckenridge, the answer is no. 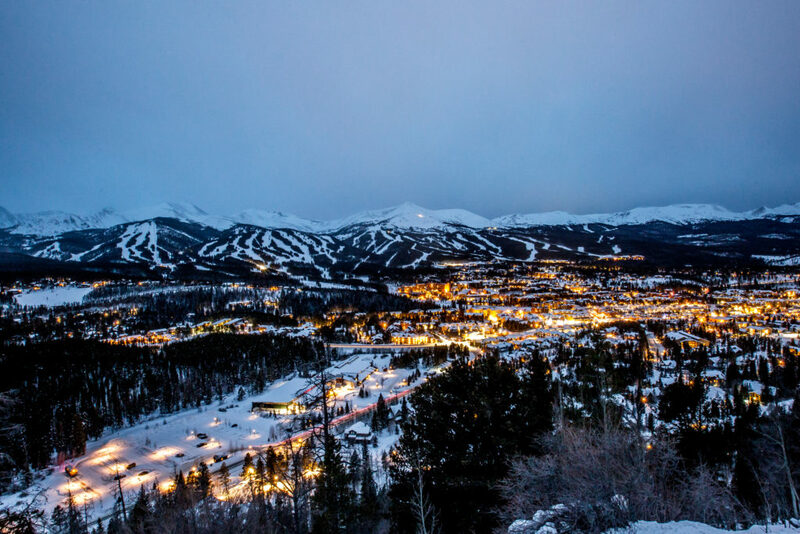 There are several shuttle companies, including Vail Resorts’ own Colorado Mountain Express with regular direct trips between Breck and Denver International Airport that can drop you at your door. 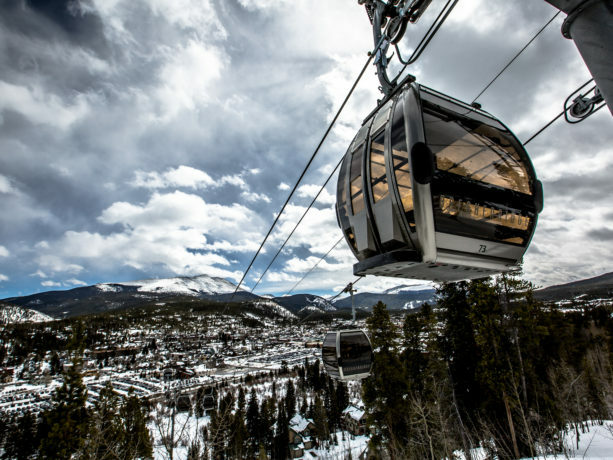 Once in town, no matter where you’re staying, there is likely a Breckenridge Free Ride bus stop within easy walking distance. They start running at 6:15 a.m. and stop at 11:15, coming in intervals of 15, 20 or 30 minutes, depending on the stop and the time of day. Easy peasy. If you’re venturing to other towns in Summit County, The Summit Stage bus also free and travels between Breckenridge and Frisco stations every 30 minutes between 5:45 a.m. and 7:45 p.m. and every hour between 7:45 p.m. and 12:45 a.m.
Taxis are a relatively rare sight in Breckenridge, but if you need to take one, High Mountain Taxi is a solid choice or Jakes Mountain Shuttle. Of course, we also have Uber up here. If you are renting a car or driving to Breck from afar, be sure your vehicle has mud and snow-rated tires. The weather can change quickly in Breckenridge and it’s not uncommon to see snow and sleet in June or August, so good tires are key. From October through April, they’re also required by law on Interstate 70, the main drag between Denver and the mountains. Another crucial piece of advice regarding I-70 is that you should avoid it during peak travel times. In the winter especially, the westbound lanes from Denver tend to become a parking lot every Saturday and Sunday morning and afternoon … even on Friday evening. Leaving Breckenridge to drive to Denver, eastbound traffic can back up beginning around 2 p.m. to about 7 p.m. The Colorado Department of Transportation has a useful app to help you steer clear of the gridlock. Once in Breck, driving is simple, as the place is fairly compact and roads are straightforward. Parking is available at most lodges, hotels, condo complexes and homes, but at some locations, you might have to seek parking elsewhere. If you’re driving in to ski for the day, free parking is available south of town in the Satellite lot or on the north side of town in the Ice Rink lot. Within walking distance to the gondola, the North and South Gondola lots and the Gold Rush lot are only $5 per day Monday through Thursday and $12 per day Friday to Sunday and on holidays. Slopeside parking is available at the Beaver Run Lot at Peak 9, which runs $15 per day Monday through Thursday and $20 per day Friday to Sunday and on holidays. With the exception of October and May, when you park downtown in Breck for more than 15 minutes (free), you have to pay between $.50 and up to $12 for the whole day. This goes for street parking and most of the small parking lots around town, many of which are free after 3 p.m. Parking in downtown Breck is much simpler with the Passport app. Keep in mind that you cannot park on any street or in any town lot overnight. If there is no parking lot or driveway at the place you’re staying, overnight parking is available at the Satellite Lot north of town or at the Ice Rink lot south of town beginning at $5 per 24 hours.